Silverfish are about 1/2 inch bluish-silver wingless insects with hard exoskeleton. Their abdomen is tapered at the end giving them a fish like appearance and their movements are very similar. • May also eat cereals and flour etc. The female silverfish is believed to lay about 100 eggs, either singly or in groups, usually in crevices and cracks and are glued to the surface on which they are laid. They are small and white when first laid but soon turn brownish and are difficult to find. The time they take to hatch varies from two to eight weeks, depending on the temperature and humidity of the breeding site. Newly hatched insects are about 2mm long and resemble the adults in appearance. The time they take to reach maturity may vary from a few months to over a year, depending on the temperature and humidity of their surroundings. The presence of silver fish is an indication of damp conditions. This may be a warning that repairs are needed. Look at the floor, walls and ceiling for signs of staining due to dampness. Check that all the water pipes, gutters and damp proof courses are intact. Another common problem is condensation sometimes caused by drying washing indoors (especially by an unventilated tumble drier) or by cooking. Silverfish can be easily controlled with an insecticidal spray treatment which can be carried out professionally by Graham Pest Control. 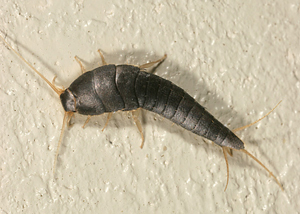 If you suspect you have a silverfish infestation in Edinburgh, Glasgow, Aberdeen, Dundee or Perth, call GRAHAM pest control today and we could help.